Squatting and lifting are often considered a male only option, the amount of times one of my students has said to me “weight lifting is only for men” or “I don't wan't to be muscular” always astounds me. I do understand but building muscle is so underrated, let me explain something that will help you understand a key component to the perfect body. Every body you admire e.g. actress, celebrity or singer who has the body of a goddess will on a regular basis weight train. Training with weights is so effective every personal trainer includes it into their routines because you simple can't make any progress without weights. 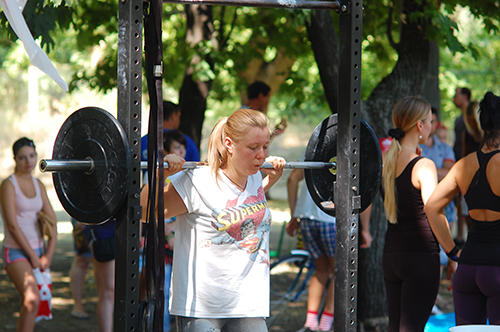 I wrote the importance of squatting for women so you can get started quickly. For video guides and a complete daily workout check out my 12 week exercise plan and app. What’s the powerlifting squat? How is it different from the bodybuilding squat? Why would you choose one over the other, what’s good about the powerlifting squat, and how to do it correctly? This article will attempt to answer all of those questions, and then some. First, the question of motivation. Why should you squat? Why is the squat good for you? Many coaches and instructors say that squatting is great because it evokes the biggest muscular growth. Do you need to have huge legs though? That’s probably not the thing you are thinking about the most when you’re picturing your goal body. You also don’t regularly pick up weights of over 100kg off the floor. Because squat is the lift that will make your whole body stronger. Not just your legs. And squat has immense therapeutic potential. It’s the panacea lift. With squat, your spine and legs will get healthier. Your posture will improve. Your bones will become denser. If you regularly squat decent weights, you will walk away with a bruise from a situation where another man will get a broken bone. And bad knees from squatting? Myth. Squats will damage you if you do them wrong (which, by the way, includes not going to the parallel or lower). I started squatting with scoliosis and wrecked kneecaps. After a few months of powerlifting, my knees stopped being an issue, and my posture improved immensely. And diseases associated with old age, such as osteoporosis or lower back pain? You can forget about them if you squat. Squats also make you stronger in all movements. Squats make your whole body work, not just your legs. Your back, particularly the lower back, your abs, your hips, everything will get stronger with squats. Why? Because keeping yourself from falling over while a barbell that weights more than you stays on top of your spine makes all your muscles work. They have to stabilize all that weight. Your nervous system has to make sure that you do not end up with your face on the floor with a heavy barbell on top while sending frantic “PUSH! PUSH!” signals to your legs. And, of course, the legs themselves work like crazy. Speaking of how much your legs work. The powerlifting squat differs from the bodybuilding squat is that the movement is not optimized to isolate your quads and make them grow. No, the goal of the powerlifting squat is to take as much weight as possible and, well, squat it to parallel and back up. It does not matter how good of the workout your legs receive; what matters is how much weight you can lift. Do not expect the powerlifting squat to make your legs as defined as a bodybuilding squat will. 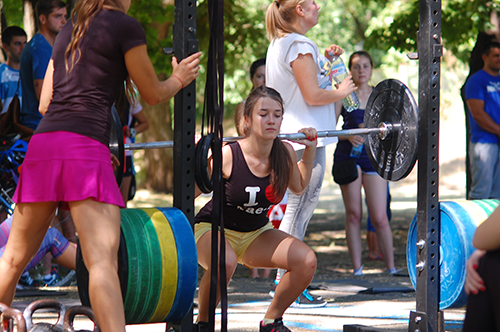 The powerlifting squat is also known as the low-bar squat. It is called that way since the bar rests not on the top of your spine, but a bit lower. This results in a shorter lever (lever in this case being the distance between the barbell and your hip area), and lets your legs move a bigger weight. The added weight means more work for your core muscles, which are used in all everyday life movements, and most sport-specific movements, instead of using specifically your quads, as a bodybuilding squat does. The powerlifting squat works your back, abs, and hips more. If that is what you want, read on to learn how to perform the powerlifting squat correctly. The squat should be done either in a power rack or in a squat stand. When using the power rack for squatting close to your one-rep max be sure to squat INSIDE the rack, not outside of it. You also want to use the safety bars in the rack. Don’t be lazy and set them to the adequate height. This is important not only for the obvious reason of being able to dump the weight on them if it’s too much, but also for being calmer and more focused during your squat. Squat requires a right mindset. You are going to have double or triple your weight on the barbell after half a year of training. This weight will seem like a lot. Safety bars and the protection the rack provides just let you squat without thinking about “what will happen if I fail the rep”. So use those safety bars, and don’t forget to set the pins to an adequate height. If the racked bar is on the level of your mid-sternum, you are doing it right. Grasp the barbell with an overhand grip. Typically you will want to grab the barbell as close to shoulder width as possible, since that will make your upper back muscles tighter, and you’ll have better support for the barbell. If you can’t have such a close grip, a wider one is okay. You will gradually adjust to a closer grip. Then, go into a semi-squat under the barbell. Dip your head below the barbell, and move under it so you feel it with the spine of the scapula and with your feet shoulder-width apart at about 30o degree angle from, uh, your nose. The picture should clarify the feet position. Once you are in position, create a “shelf” under the traps and on top of posterior deltoids for the bar to rest on by lifting your chest and elbows at the same time. It is very important to make sure your arms are not carrying the weight of the barbell, but are just stabilizing it. Raise up keeping your upper body tight, and make a step back. Now what you have to do is imagine that you are sitting down on a low stool that is between your legs. This is very important – you sit down between your legs. Even more important, you sit down at least until your thighs are parallel to the floor. Contrary to popular belief, squatting higher than parallel is what damages the knees. Squatting at, or below, parallel, is in fact beneficial. During the squat your knees should move until they are a bit farther out than your feet, and the knees to be in line with toes at all times. Letting the knees move towards each other is what damages them very quickly. Once you hit parallel, your back angle should be about 45o degrees. From this position, move your hips straight up, or imagine tearing the floor apart to the sides with your feet. Once your knees and hips are fully extended, re-rack the barbell, or do more reps.
Hopefully this guide will serve as a good starting point for anyone looking to better themselves through lifting weights. There’s no doubt that squats are one of the best exercises any athlete can do, but it’s important to remember that good form is paramount, especially if bigger weights are used. Once you are lifting more than 50 lbs it is time to consider protection for your body. First I would suggest a pair of 7mm knee sleeves – knee sleeves protect your knees from injury, the more weight you add the more pressure you are adding to your joints. Wrist wrap gloves – essential for lifting any weight and not just a barbell, keep you palms protected and the additional support for your wrists prevents injury. If you are intending on lifting heavy weights it is essential you purchase a good quality belt made from leather. Trust me the last injury you ever want is a back injury. The are more for a regular lifter but weight lifting shoes make a big difference and can cost a small fortune. Wrong execution of squats is exactly what gave this movement its bad rap, and forsaking proper form means failing to reach your strength potential and getting injuries.